On Friday, November 2nd, 2007 Inlaws & Outlaws will screen at the University Baptist Church in Austin, Texas. This will be a FREE screening, and all are welcome to attend. The screening will begin at 7:00pm. This screening will form part of Inlaws & Outlaws' Texas Outlaws Tour, which brings the movie all over the Lone Star State throughout October and November. Associate Pastor, Rebekah Falk and Snr Pastor Dr. Larry Bethune welcome all to attend this screening which has been provided by the University Baptist Church as a Free resource to its congregation and surrounding community. 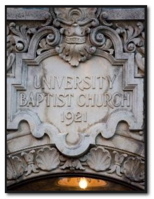 Since its founding in 1908, University Baptist Church has been known as Austin's Progressive voice of faith, reaching far beyond its campus near the University of Texas to call Austinites into a dynamic relationship with God. That relationship, based on the Gospel of God's love for all persons, is reflected in UBC's doctrine, in its congregation and in its work in the community. The church welcomes all persons of any age, race, gender, education, marital or family status. In UBC's inclusive atmosphere, individuals can find family, families can find community, the injured can find healing, and all can seek truth and peace in a setting of spiritual unity and trust. In 2001 the church disaffiliated with the Cooperative Baptist Fellowship after that organization had taken an official position not to expend funds for organizations or causes that condoned or affirmed LGBT practices. The church's primary denominational affiliation is now with the American Baptist Churches of the USA.